A 5am start was always going to be tough, particularly after such a successful event in Kyoto. That said, with cases packed, we headed to Kansai Airport…. next stop Beijing! After a three hour flight, the ChemComm International delegation arrived at Beijing International Airport where we had a four hour layover. After lunch, we were joined by the RSC Publisher for China, Dr Daping Zhang, and Professor Keiji Maruoka, the final international speaker for the next two events. The flight to Lanzhou was smooth and, to our delight, we were met by the former director of the Key State Laboratory and member of the Chinese Academy of Sciences, Professor Yong-Qiang Tu. Following a buffet dinner accompanied by excellent regional red wine, the speakers retired early with one eye on the second symposium. 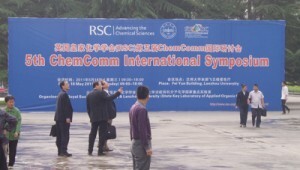 The following morning, we were greeted at the entrance to Lanzhou University with possibly the largest ChemComm advertising sign I have ever seen. ‘Big’ was certainly the theme of the day, with Professor Wei Wang informing speakers that an audience of around 400 was anticipated with 80 posters to review over lunch. Professor Tu opened events and chaired the first session, inviting Professor Xinhe Bao to the stage. Professor Bao gave a beautiful overview on some of his very detailed studies into heterogenous catalysis within nanotubes and other nano-confined systems. Using nobel metals or metals such as iron or nickel, it was shown that the conversation of syngas was much more efficient inside the tube than outside. The subject of the session then switched to metal-free homogenous catalysis, as Professor Maruoka spoke about some of his latest results in the field of organocatalysis. As you would expect, high enatiomeric excesses and yields were the order of the day. 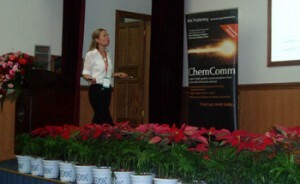 Following coffee, Professor Veronique Gouverneur gave another whistle-stop tour of her group’s latest organofluorine chemistry and the formation of C–F bonds using palladium and gold homogenous catalysis. As in Kyoto, the speakers worked hard over lunch analysing the 80 posters on show. 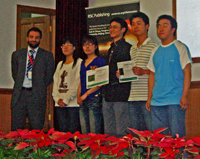 They covered everything from organic methodology, to total synthesis, organic materials and supramolecular chemistry. If they thought judging them was tough in Kyoto, it proved even more so in Lanzhou! Unfortunately, Professor Ben Feringa was unable to act as a judge, because, due to a last minute laptop crisis, his presentation was being transferred to a spare laptop, with his own laptop in pieces, being fixed by helpful student Mr Woo. 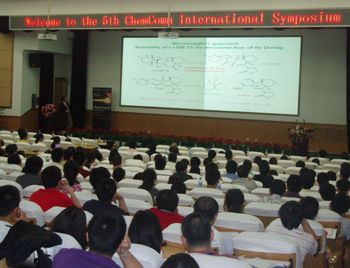 After lunch, the conference switched gears to total synthesis. Professor Dawei Ma spoke first about the total synthesis of galbulimima alkaloids and communesins. Professor Ma was followed by Professor Viresh Rawal, who gave a different talk to that described in the programme. Professor Rawal described his recent total synthesis of Pederin and Mycalamide B, both part of the Pederin family of natural products isolated from the beetle Paederus fuscipas. He also introduced initial work looking at bioactivity of Mycalamide in cells, carried out with Milan Mrksich. For the final session, the audience were treated to a masterclass from Ben Feringa on molecular motors and switches. This was only made possible by Mr Woo, who had rebuilt his computer, replacing a transistor, and bingo! His synthetic motors, inspired by nature, are unidirectional with the direction controlled by the enantiomer used. By adding legs, the motors can be bound to gold surfaces and then used to change the orientation of liquid crystal films. A great talk and even Professor Bao, the session Chair, could not bring himself to cut it short. Thank goodness for Mr Woo! The final talk of the day was presented by Professor Deqing Zhang on tetrathiafulvalene-based switchable molecular systems towards functional materials. The evening social events were as memorable as the science, with the speakers joined by 50 or so guests including the vice Dean of Lanzhou University. The Chinese banquet was enhanced with locally produced red wine and Chinese liquor (only to be drunk in multiples of three – Chinese style…kambai). After many toasts and speeches, the speakers were taken to a local pub for some traditional Chinese music. The night was not done, however, as we then moved to a Tibetan bar. The speakers were told to expect local singing and dancing. Little did they know that they would be involved! After being sung to, each speaker was presented with a white Hada. What a great way to end such a action-packed day. Next stop Tianjin for the final event of three…..